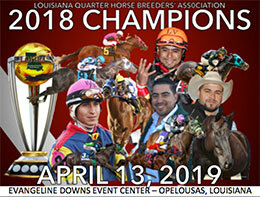 The annual LQHBA Meeting and Awards banquet to honor the association's 2018 racing champions will be held Saturday at Evangeline Downs in Opelousas. LQHBA is the state racing affiliate of the American Quarter Horse Association. It is also the official registry for accredited Louisiana-bred racing Quarter Horses and is recognized by the Louisiana Legislature and the Louisiana State Racing Commission. Since its inception in 1966, the association has developed a number of programs to further breeding and racing in Louisiana. Last year, purses in Louisiana totaled approximately $21 million, and breeders' incentives for mares and stallions exceeded $5 million. LQHBA oversees the annual LQHBA Yearling Sale and Fall Mixed Sale and has raised and donated over $570,000 to support its Louisiana youth scholarship program.